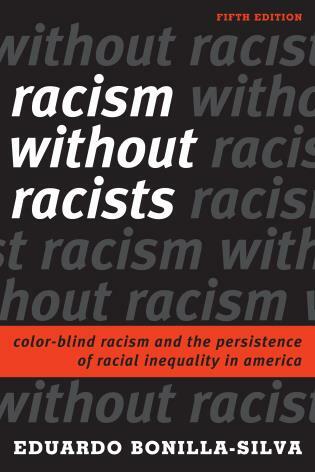 Eduardo Bonilla-Silva’s acclaimed Racism without Racists documents how, beneath our contemporary conversation about race, there lies a full-blown arsenal of arguments, phrases, and stories that whites use to account for—and ultimately justify—racial inequalities. This provocative book explodes the belief that America is now a color-blind society. The fifth edition includes a new chapter addressing what students can do to confront racism—both personally and on a larger structural level, new material on Donald Trump’s election and the racial climate post-Obama, new coverage of the Black Lives Matter movement, and more. This entry was posted	on Wednesday, July 5th, 2017 at 13:25Z	and is filed under Barack Obama, Books, Media Archive, Monographs, Politics/Public Policy, Social Justice, Social Science, United States. You can follow any responses to this entry through the RSS 2.0 feed. Both comments and pings are currently closed.